© Firmount Veterinary Clinic, Antrim 2016. Save to the extent expressly permitted, the context of these pages may not be reproduced or transmitted or made available on a network in whole or in part without the prior consent of Firmount Veterinary Clinic, Antrimn. These pages may be downloaded or printed for your personal and private use provided that you make no alteration to any of these pages and you do not use any part of the pages in any work or publication in whatever medium stored. The materials contained on this web site are provided for general information only. 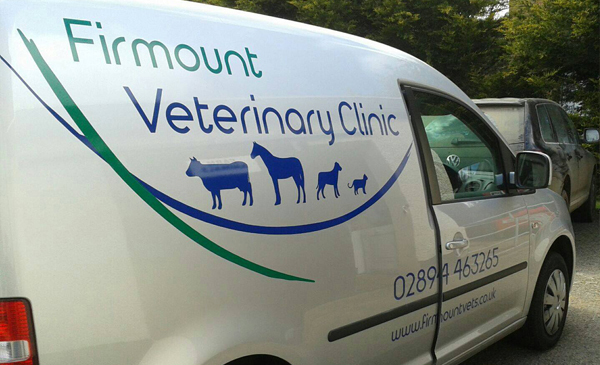 Firmount Veterinary Clinic, Antrim assumes no responsibility for the accuracy of any particular statement and accepts no liability for any loss or damage which may arise from reliance on the information contained on this site. Links to other web sites from these pages are for information only and Firmount Veterinary Clinic, Antrim takes no responsibility or liability for access to or the material on any web site which is linked from or to this web site. By providing links to other sites, Firmount Veterinary Clinic, Antrim does not guarantee, approve or endorse the information or products available at these sites, nor does a link indicate any association with or endorsement by the linked site to Firmount Veterinary Clinic, Antrim.